The interesting story of the Downton Mini, by Ian Nicholls. In the 1960s many tuning firms established them selves on the back of the Mini’s success: Broadspeed, Alexander, Taurus etc. However only one outfit had BMC approval and contributed more to the BMC>Rover story than just selling go faster bits for the companies products. That firm was Downton engineering. In 1947, Daniel and Bunty Richmond took over a garage in the Wiltshire village of Downton. They had first teamed up shortly after the second world war. Daniel had first worked as a land agent and then for British European Airways. Bunty was actually born Veronica Romer, the daughter of a high court judge and was related to the writer Somerset Maugham. Although they were known as Mr and Mrs Richmond, they never actually married. At first they specialised in engine work on such upmarket makes as Rolls Royce and Bentley, but in 1957 Daniel Richmond was asked to tune a humble Morris Minor. He was disappointed with a proprietry tuning kit and decided to develop his own. 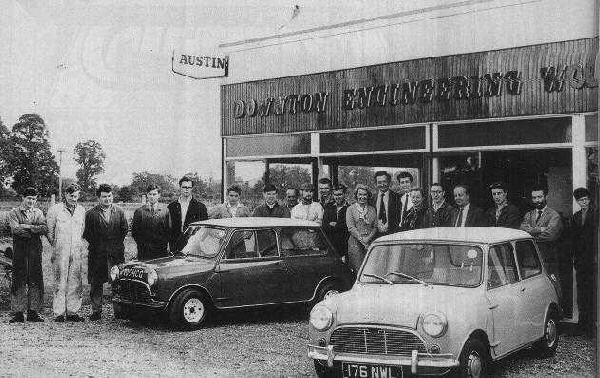 Within three years Downton engineering as it was now known was specialising in tuning kits for such cars as the Minor, Austin A35, Austin-Healey Sprites, Sunbeam Alpines and Triumph Heralds. Also around 1957 Downton employed two Hungarian refugees from the ill-fated uprising, George Toth and Jan Odor. Toth became the head of the firms cylinder head shop and Odor became an exhaust specialist. The turning point, however, came in 1961. Downton got hold of the newly launched 997cc Mini Cooper and increased its engine capacity to 1088cc. Several magazines tried the car, 860MW. AUTOCAR tested the car and clocked 103 mph and a 0-60 time of 9.6 seconds. Journalist Ronald “Steady” Barker rang Alec Issigonis and said “I’ve just done something over 100mph in a Mini”. Issigonis demanded to see the car, so Barker drove the Mini Cooper to Longbridge, where the car’s creator thoroughly enjoyed himself driving it. Within a fortnight, Daniel Richmond was sent for, and was appointed technical consultant to BMC. AUTOSPORT magazine achieved even more impressive performance out of 860MW, top speed of 108mph, 0 to 60 in 8 seconds. 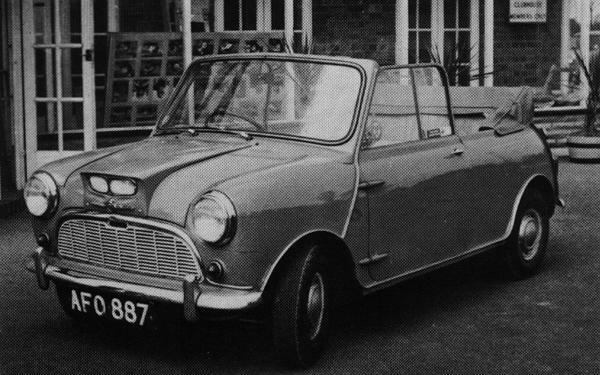 Downton’s first significant work for BMC was the 12G295 cylinder head, which first appeared on the ADO16 MG 1100 saloon of 1962 and in 1964 on the 998cc Mini Cooper. This design of cylinder head featured more open combustion chambers and better flowing ports than previous A-series engine heads. Downton were soon supplying heads to the Abingdon Rally cars and engines to the Cooper Car Company’s racing Mini’s. 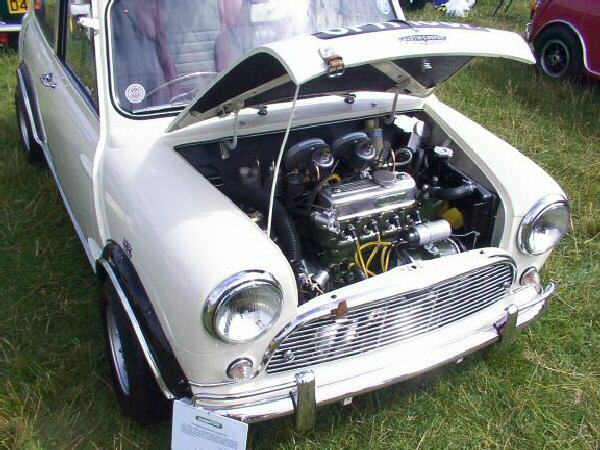 John Cooper may have developed the original Mini Cooper, but the legendary Cooper S was a Downton engineering creation in collaboration with Morris engines at Coventry. The cars 12A185/AFG163 cylinder head was designed by Daniel Richmond. 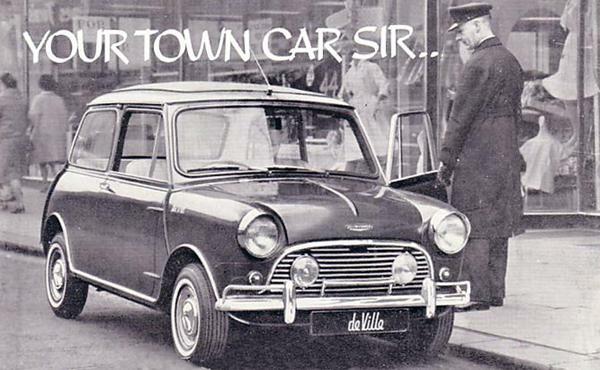 The Mini’s glory years were the 1960s, and Downton was the catalyst. Other Downton contributions for BMC were the 12G940 cylinder head, found on so many 1275cc engined cars since 1966, and the 1800 S “Landcrab”. Daniel Richmond also helped design the DX engine for the stillborn Mini replacement, the Issigonis 9X and helped turn the E-series into a half decent engine. The Downton garage was next to the Bull Public house, which was rather apt, as both Daniel and Bunty Richmond, the latter being the business brains in the outfit, were notorious for their alcohol consumption. It was even said that engine parts were bathed in gin! Even if Daniel and Bunty Richmond were not actually alcoholics, alcohol did feature reguarly in the working day. One employee was asked at his job interview, “Do you drink”? When the candidate replied to the affirmative, Daniel Richmond replied, “Good, because we don’t employ anyone who doesn’t drink”! Bunty favoured dry Martini’s, while Daniels preferred tipple was champagne. A visit would often turn into a drinking session. 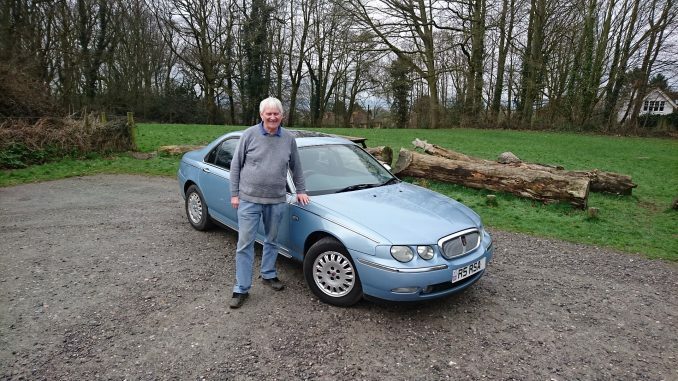 One time editor of MOTOR magazine Charles Bulmer recalled: “By the time you’d been to lunch with him (Daniel) you had a job to find your car let alone drive it home”! Every evening at 6PM, young Downton employee Richard Longman would go in to the firms office and make Bunty Richmond a dry Martini or they would go down to the Bull pub. The Richmonds had chosen the village of Downton for their business because of the the excellent fishing. Daniel was devoted to fishing as Richard Longman later recalled: “He’d often go to the Bull for lunch and then go fishing, coming back at four or five o’clock. Sometimes he’d take people salmon fishing-customers or Longbridge engineers”. Bunty ran the office. One employee described her thus: “She was frightening-horrific. She could shriek. She was a very dramatic person in everything she did, with an aristocratic poise all the time”. Richard Longman adds to this: “She was very dominant. She’d line Daniel up against the garage door and kick him if he did something she didn’t like. People were frightened of her: she’d tear them off a strip. She didn’t care who they were-customers or anything. If they parked in her parking spot she’d throw them out. She was the sort who believed the customer was never right”. In 1962 Bunty discovered Daniel in the act of giving Jan Odor a bonus for his excellent work. She violently objected, saying Odor was paid enough already. A blazing row ocurred and Jan Odor walked out to found his own tuning firm, Janspeed. Another ex-Downton man simply said of the Richmond’s to this writer: “They were not nice people”. The Richmonds were also eccentrics. They didn’t take cheques, it was cash or nothing. In one case a car owned by Gerard Lascelles, cousin of Queen Elizabeth II no less had his car in for modification. His car would not be released until a cash payment was made. An equerry had to come from London with the payment in cash. Also woe betide anyone who arrived after closing. A customer came all the way from Germany and had to stay in the Bull overnight because Bunty refused to open up. Indeed, and Downton’s conversion for the MGC was said to improve the much maligned car. To Downton engineering the 1960s must have seemed like a party that would never end . The rich and famous queued up to have their BMC cars tuned by Downton, even Enzo Ferrari! In 1968 BMC merged with the Leyland group to form British Leyland. BLMC did not like having consultants, and Daniel Richmond’s contract was cancelled. New BLMC chief engineer Harry Webster who had replaced Alec Issigonis told Richmond at a meeting that he was the man behind all the Cooper S warranty claims and that his services would no longer be required. At this point he started to lose interest in the business and many valuble staff started to leave. Daniel spent more and more time at his Devon cottage fishing. The consultancy fee he earned from the 12G940 cylinder head was used to puchase a stretch of river bank and later he bought the opposite side with the fee he got for the ADO17 1800S. Years of heavy drinking and smoking started to take their toll and in 1974 Daniel Richmond died at the early age of 46 (or 50 depending on which account you read). In 1975 his wife Bunty committed suicide and the firm closed down. Her suicide note requested that Charles Griffin find a home for the firm’s development Mini which is now at the Heritage Motor Centre at Gaydon. By then many key staff had left to set up on their own. As recounted earlier Jan Odor had formed Janspeed. George Toth went into partnership with fellow Downton collegue Richard Longman to form Longman engineering in 1971. David Dorrington went on to form Maniflow in 1973, Brian Slark started up Slark Race engineering also in 1973 and Steve Harris formed his own tuning firm in Dorset. Interestingly both Longman and Slark recomend Maniflow exhausts – now you know why. The Mini story would be a lot different if it hadn’t been for Downton engineering, for they were the power behind the glory. But Downton’s legacy lived on in BMC>Rovers products. The 12G940 cylinder head on the 1275cc A-series engine enabled the companies products to be competitive into the 1980’s when used on the Metro, Maestro and Montego. The camshaft on the MG Metro was similar to a Downton developed profile, whilst the cylinder head on the R and S-series engines had its origins in the Downton developed E-series. A surviving Downton Austin Mini Cooper S, photographed by Ian Nicholls at “The Mini in the Park 2002”. Note that it has twin 1 1/2 SU carbs instead of the factory twin 1 1/4 SU’s. I worked there until the closure and it was a very sad day indeed. Just to let you know that I have amongst other items the original black and white photo as shown at the top of your page. It was passed on to me by Bunty after the works had closed. now having reached retirement i am releasing some items for others to experience.Look out for the photo (if you should be interested) as I am shortly to put it up for grabs. Hi Bryan, My wife and I are writing a history of Downton village and will be using a summary of a couple of sites about the Downton Engineering Company (with proper attributions) in the book as part of the trade and industries of the area. Am I right in thinking you were associated with the company or know someone who was? I am looking for a personal recollection or two to add if that is possible. Are you able to assist please? Thank you. This site is where you’ll do well for contacts. Run by Mark Forster is the one to contact. He knows loads of people who were involved at Downton.